The San Antonio Spurs weren’t the only ones that were beating the Heat this week. At Madison+Main we locked ourselves in, rarely ventured outside and soaked up the deliciously abundant air conditioning provided by our friends at Howell’s Heating and Air. (Howell’s is a long-time client and provided our new HVAC system at 1st & Cary.) The weather outside? Upper 90s. The weather inside? Sunny and 70. Monday, June 15: I squeezed one more day out of the weekend and goofed off with my son Jack in the OBX. Monday highlights included driving on the beach in “The Beast,” catching some blues and sea mullet, flopping in the waves at Oregon Inlet and watching the US beat Ghana at Captain George’s in Kill Devil Hills. What’s more American than watching team USA at an all-you-can-eat seafood buffet? 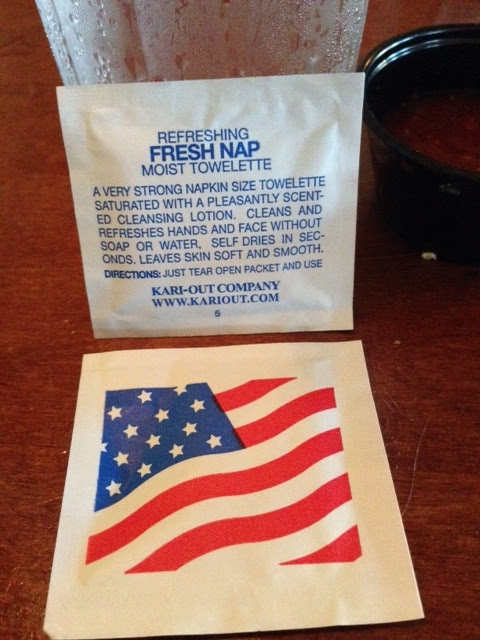 Answer: USA flag wet naps. Tuesday, June 16: On Tuesday I paid for my long weekend by putting in a 15-hour day. 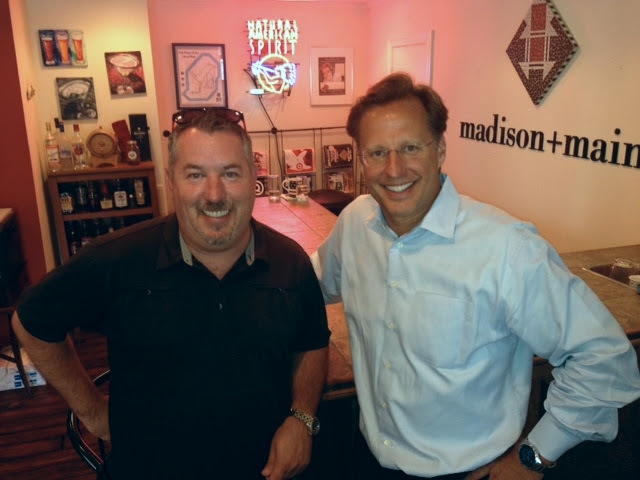 7th district Republican candidate for Congress Dave Brat made his first public appearance at the Midlothian Rotary and at the office we worked on a ton of mid-year media plans for clients like SkyZone, Lucy Corr Village, and Davis & Green Electrical. At lunch, we tried out American Tap Room at Willow Lawn and had a great meeting with theGreen Top brain trust, GM Jimmy Hyman and Marketing Director Bob Strepka. In case you’re wondering…Bob and I had the chicken and waffles. #mmmmm Green Top is one of my all-time favorite stores and I always checkout the fishing report before I go fishing. Check it out here. On Tuesday evening, we attended Village Bank‘s company-wide meeting at the Cultural Arts Center of Glen Allen, where we unveiled their new TV spot. Everyone told me they liked it and those in attendance applauded loudly, even though the IT guy played the ad three times in a row. Wednesday, June 17: On Wednesday morning the Village Bank TV spot hit the airwaves. Let us know what you think of this “People-Powered” commercial. On Wednesday evening we hosted our monthly Media Mixer at Casa Del Barco. It was a great time and a big turn out, considering even long-time Richmonders don’t know how to find the place. Seriously, the folks at Casa Del Barco were very hospitable, the food was amazeballs and we were all impressed by the quality and quantity of their tequilas. Thursday, June 18: On Thursday I spent most of the day working on a top secret project. Hopefully I will have a BIG announcement next week regarding this new RVA client. We have spent a few months putting this together and believe this project will make news coast to coast. Last night we were torn between eating hibachi or souvlaki…because Japan played Greece to a scoreless tie in the World Cup. Our compromise? Ribs, wings, and cornbread at Glory Days. 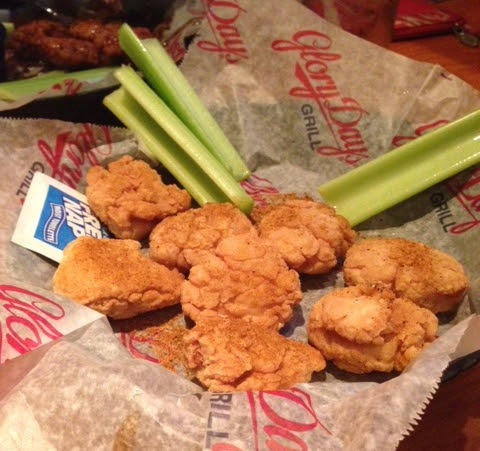 FYI: There is no such thing as a boneless chicken wing. It’s called a CHICKEN NUGGET. Friday, June 19: The building shook twice today; first between 9am and 11am as construction crews continued to tear up the corner of 1st and Cary…for the third straight month. 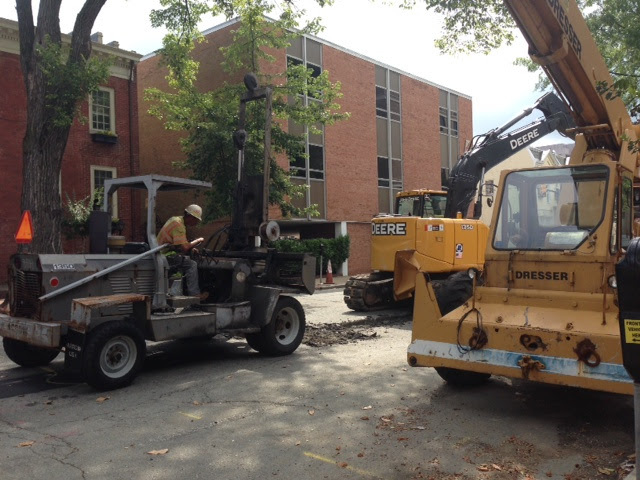 I believe the guys are taking a lot longer to get this job done because they enjoy watching and chatting with all of the lovely ladies on our block.